In an exclusive interview on Breitbart News Daily, Cruz tells host Steven K. Bannon he’d start by using overwhelming air power. He likened the effort to the carpet bombing of the Iraqi army during the first Persian Gulf War. He called what Obama is currently doing “pin prick,” or “photo op foreign policy,” given the low number of air sorties a day – from 10 to 20. During the Gulf war the U.S. was flying as many as “1,100 in a day,” Cruz notes. Cruz also said he’d arm the Kurds. When asked if he’d look to form a Bush-like coalition in the battle, “Absolutely,” said Cruz, saying it was “particularly important” to include other Middle eastern countries “that have a direct security interest in stopping ISIS.” Cruz blamed Obama’s “ineffectual” effort against ISIS for the limited buy in we’re seeing from Middle Eastern allies right now. When asked about any key differences he saw between him and fellow Senator Marco Rubio, the two have been exchanging some political fire lately, Cruz cited Rubio’s effort to “pass a massive amnesty” with the now infamous Gang of 8, saying border security is also a part of national security and the effort would not have sealed the border, as well as giving Barack Obama broad authority to allow in refugees, including those from Syria. 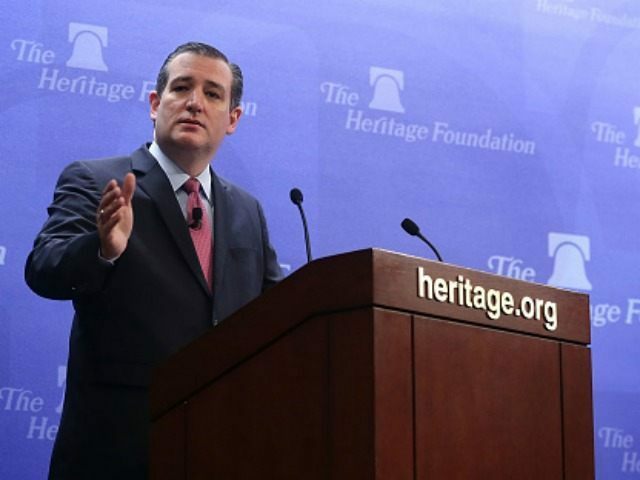 “At a time of massive threat, that is profoundly dangerous,” said Cruz.